All that and more, including new characters. 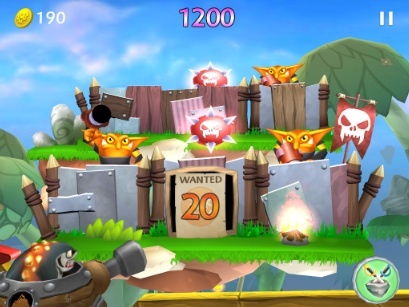 For a while, it seemed like Activision was going to leave Skylanders Cloud Patrol as is, which would have been fine, since we really enjoy the game's arcade-like play. Thankfully, the publisher decided to add even more enjoyment to this excellent iPhone and iPad title, courtesy of an update that changes the experience by offering more content. That said, the company used Cloud Patrol to put its ACTIVATE mobile gaming platform on display, which brings cloud storage of a person's Skylanders toy collection and game saves across multiple iOS devices. More importantly, it introduces a social multiplayer mode called Daily Showdowns, where players compete in contests against their friends. On top of that, we have new characters joining the fray. Chief among them, Pop Fizz, Jet Vac and Royal Double Trouble, to name a few, along with a Magic Item Factory that lets players create their own items, like score multipliers. Rounding out this impressive package is Facebook integration, and support for French, Italian, German and Spanish. In other words, if you already haven't updated Cloud Patrol, get on that pronto.